Many dream of becoming professional athletes, but only a few make it to the pros. Yet, athletes aren’t the only ones with a passion for the game. Jobs like sports reporter, race car mechanic, sports referee, groundskeeper, trainer, coach, team memorabilia salesperson, equipment manager…all of these and many more jobs allow the athletes to play their sport. Without support players, the game wouldn’t even begin. Game Day: Meet the People Who Make It Happen features stories about twenty people who make their living at or near the ball field, racetrack, court, sports information booth, snack bar, or at other sports-related venue. Sometimes people can’t participate in the sport they love, like double-amputee Ronan Tynan who, after losing his legs, competed as a paralympian. Upon retirement he became a celebrated tenor who regularly sings the opening anthem at sports events. Or Patrick Reynolds, who became a trusted NASCAR mechanic after he was forced to give up driving due to the high cost of pro racing. Cameraman Brian Burnett can ski downhill backwards carrying a heavy camera! He’s a sports photographer who lives in Calgary, Canada, and mostly shoots video footage of winter sports, sometimes in 30-degrees-below-zero weather. If he doesn’t catch the important action that often takes place in the blink of an eye, the viewer at home misses out. Also included are real-life stories about a horse trainer, figure skater choreographer, official basketball timekeeper, a baseball scout, sports agent, and “the best Zamboni driver in the world.” All have in common a passion for sports and the desire to be near the action in some capacity. 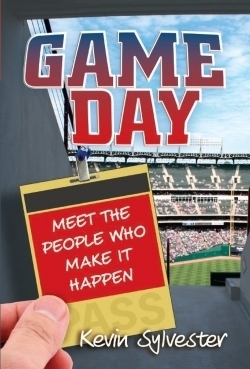 Game Day: Meet the People Who Make It Happen is an interesting and fun read. Intended for kids, it’s actually enjoyable for everyone. Well-written and easy-to-read, author Kevin Sylvester knows sports. A broadcaster on CBC Radio, he is also an illustrator and best-selling author of children’s books, including a new series about a teenage cook/detective.